EAEA GRUNDTVIG AWARD 2017. Mosaik Support Center for Refugees and Locals provides a space of warmth, safety and community for the most vulnerable populations in Lesvos, Greece. Open to everyone and built on principles of solidarity, integration and empowerment, Mosaik aims to move beyond immediate crisis response. It offers sustainable structures not only to support refugees in their resolve to live with dignity, but also to locals who have suffered from the recent crisis in Greece. Mosaik is a reaction to the dire situation of refugees and locals on Lesvos and the lack of adequate help. The project brings together over 630 learners aged 4 to 89, from 20 countries. It offers the learners language courses in English, Greek, Arabic and Farsi, vocational training in arts and crafts, upcycling workshops, music and dance classes, day care for young children, and cultural events supported by artists, activists and organisations from across the world. Everything is free of charge, including the transportation to the centre. The center was built outside the refugee camps, and it is the first project that was set up not only for refugees but also for locals. Indeed, adults with all kinds of educational and cultural backgrounds come together in the center, from university teachers to people who are illiterate. Some even attend classes for the first time in their life. Since the day Mosaik was opened, the demand for classes has exceeded the capacity of the center. 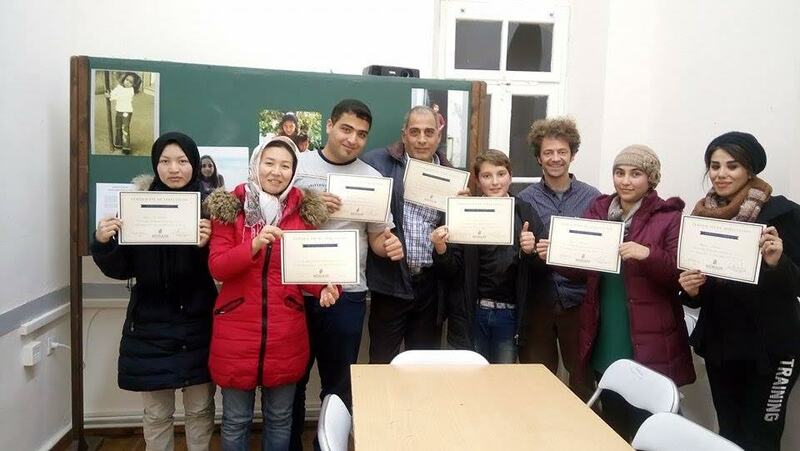 This is the case especially of language classes, which are interesting not only refugees, but also locals. Initially the classes were taught by anybody who volunteered, but the language courses are now only delivered by professional teachers, to ensure everyone has a high standard of education. The impact can be seen through the high number of interested people, both learners and visitors. Mosaik is a project to encourage other people to set up something similar, and not talk about a refugee crisis but act on it, building an inclusive community through education and recreational and cultural events. The article series shares good practices on engaging new learners by introducing the nominees of the EAEA Grundtvig Award 2017.